At Accu-Chek, we believe that you shouldn't have to plan your life around your diabetes. The Accu-Chek Insight insulin pump system lets you decide how to spend your time and makes it simple to accommodate sudden changes to your daily routine, allowing you to live an unrestricted life. 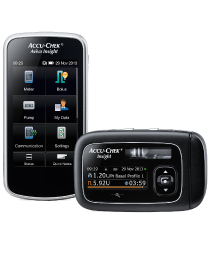 The Accu-Chek Insight insulin pump system is comprised of the Accu-Chek Insight insulin pump and Accu-Chek Insight handset. With its intuitive menu in the palm of your hand, the system offers a new level of ease of use. Its sleek design and Bluetooth capability give you ultimate discretion. Being easy to learn, this system is designed to inspire confidence in diabetes management. Are you an Animas pump user looking for your next pump? Find out how Roche can help you make the Smart Choice and a smooth transition to your next pump. Learn more. The Accu-Chek Insight insulin pump system is designed for easy and discreet insulin pump therapy. This system has been developed to inspire confidence in your diabetes management bringing together blood glucose monitoring, bolus advice, insulin delivery and data management. Discover intuitive diabetes management that fits into your life. The insulin pump is controlled by two microprocessors. The safety concept is based on one processor (supervisor processor) supervising the other (main processor). A variety of cases and accessories to help carry your pump, including a sports belt designed to help carry the insulin pump during sport activities to elegant cases to discreetly store your insulin pump. To purchase any of the items shown, please contact the Pump Careline. A flip case designed for the Accu-Chek Insight pump to be worn on the belt. This case comes with a choice of either adult or children's patterned inserts. This polyester belt can be worn over clothes or directly against the skin. It has a built-in pouch for the insulin pump and an additional zipped pouch which can be attached to the belt to carry a handset. This black leather case has a loop allowing it to be worn on a belt. It has a simple and discreet design. This cream leather case has a loop allowing it to be worn on a belt. It has a simple and discreet design. Made of soft and stretchy material, this insulin pump pouch can be worn discreetly under your clothes. Available in 3 sizes (S,M,L) and in black or white. Made of soft and stretchy material, this protective pouch attaches discreetly to bras. The simplicity of the design ensures maximum comfort. Available in black or white. Order infusion sets, record books and other supplies for your insulin pump here. Download user manuals and access the elearning tool here. Already an Accu-Chek Insight owner? Register your insulin pump here. Schöllkopf K et al. ‘The novel Accu-Chek® Insight insulin pump system – Step analysis of user-relevant routine tasks. Poster Session Diabetes Technology Meeting: 2013 Oct 31 – Nov 2: San Francisco, CA, USA. Cavan D et al, Use of insulin bolus advisor improves glycemic control in multiple daily injection (MDI) therapy patients with suboptimal glycemic control: First results from the ABACUS trial. Diabetes Care 2013; 36 (1): 3613-9. Barnard K et al. Use of an automated bolus calculator reduces fear of hypoglycemia and improves confidence in dosage accuracy in T1DM patients treated with multiple daily insulin injections. J Diabetes Sci Technol. 2011; 6(1): 144 – 9. Zisser H et al. Clinical performance of three bolus calculators in subjects with type 1 diabetes mellitus: A head-to-head-to-head comparison. Diabetes Technol Ther. 2010; 12(12): 955 – 61.